There are tons of homemade vegetable soup recipes out there. I’ve made vegetable soup with pasta and veggies, beans and veggies, whole grains and veggies, and just veggies. There are so many different varieties, it almost never gets boring. Plus I love soup, especially right now when it’s so cold outside. 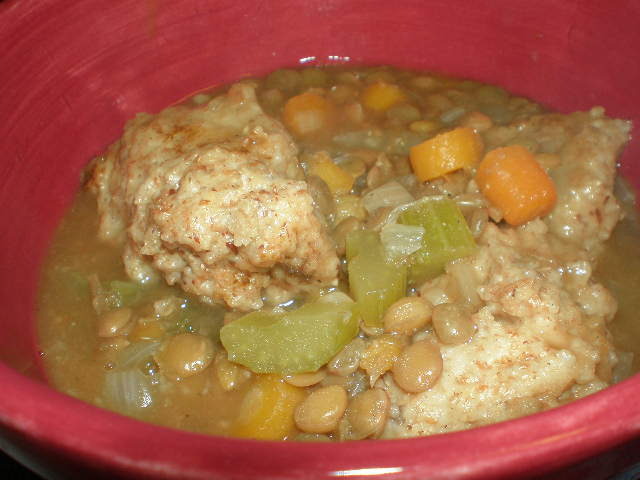 But I never really thought of vegetable soup as “comfort food”, until I made Lentil & Vegetable Soup with DUMPLINGS. 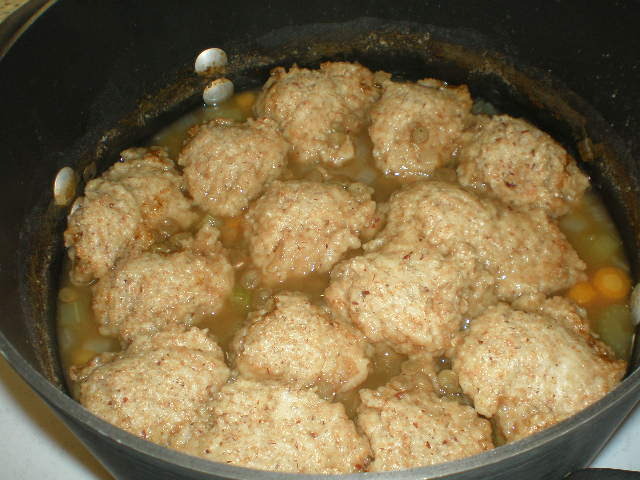 I found this recipe over at Hillbilly Housewife and I immediately wanted to try it because I’ve never made anything with dumplings before. What is a dumpling anyway technically? The only dumplings I’ve ever heard of are in chicken and dumplings. I’ve never heard of vegetable soup with dumplings. First make the soup. Place rinsed lentils and water in a large pot and bring to a boil. Reduce heat and simmer for 20 minutes. While the lentils are simmering, mix ground flax with water in a small bowl and place in refrigerator so it can thicken up a bit. Then chop the carrots, celery and onion. After the lentils are done simmering, add vegetables, bouillon, garlic and pepper to the pot. Stir and allow to simmer for 20 more minutes. While the soup is simmering, prepare the dumplings. In a large bowl combine soymilk, oil and flax-water mixture. Add both flours, baking powder, salt and sugar. Mix until it forms a stiff batter. When soup is done simmering, it’s time to drop in the dumplings. Drop rounded teaspoons of batter into the soup. Continue until all dough is used. Here are the dumplings going into the pot. I wasn’t sure I would be able to fit them all in there, but I did. Once all dumplings are in, cover the pot tightly with a lid. Do not move this lid for the next 20 minutes! Absolutely no peeking. The dumplings cook not only from the boiling soup, but also from the steam that builds up in the pot. If you take the lid off you’ll release that precious steam that is needed to cook the dumplings. 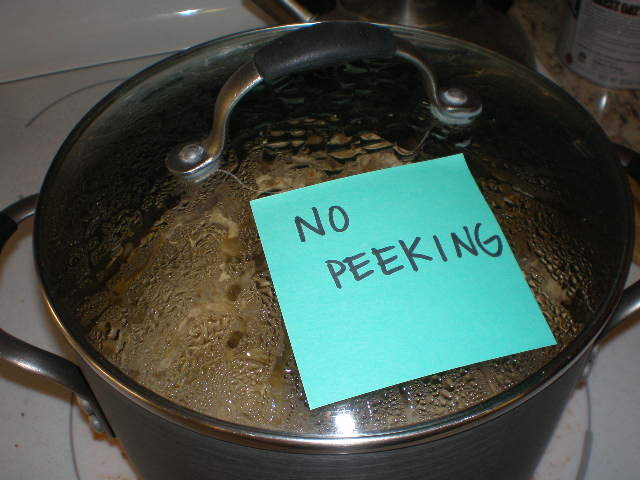 I had to put this sign on the pot to keep Benzo out during dumpling cooking time. He has a tendency to get into my cooking when I’m not looking. Eating this soup was like having a warm blanket around my shoulders. It was perfect on a cold, snowy night. This recipe is not exactly a quick dinner as it requires about an hour of cooking time and a fair amount of chopping. If you do have some extra time though, it’s completely worth the effort. And although it takes time, it is not complicated at all. This soup is wholesome, healthy, and very filling. I served it on its own for dinner for the both of us and the next day we each had a huge bowl for lunch. This is the second recipe I made from Hillbilly Housewife. The first was lentil chili. I love her down-home, no-nonsense, from scratch recipes. I also think her page on homemade convenience foods is really interesting. I’ll definitely be trying some of them! Have never tried a veggie recipe before. I guess I’ll try it soon. Thanks for the tips. Wow, looks and sounds so healthy and good. yay! vegan recipes! i’m definitely trying this soup… i could use some right now. All of us the children included have been eating almost exclusively home made food for ten years. We do not have a garden but we go to the market as much as possible to buy fresh food. It is a lot of fun for the children. Thank you and best of success to you on your journey a journey may family and I are on too. It is all about being a conscious eater and you are indeed. P.S. One note, although my family still eat wheat, I have heard that a number of people who eat a lot of wheat (like some people eat alot of dairy) they find they feel better when they cut back on their wheat consumption. I am not a doctor – just interesting information I wanted to share. This looks yummy! Even the kids would eat it I’m guessing! I’ll give it a try and come back here to post. Give one of mine a go and let me know how you liked it!! Cute. I love your no peeking sign. Nice recipe.. thanks for share! Thank you for what looks to be a delicious AND nutritious vegan recipe. I had given up on dumplings, assuming they couldn’t be made without eggs. This is exciting! I felt like having a lentil soup tomorrow, anyway–what a great coincidence. Thanks for sharing. wow, it looks verry good. thanks for sharing it. 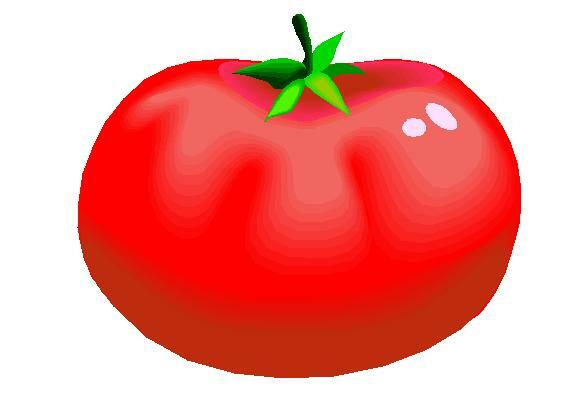 I just wanted to say that I love your website as it has caused me to think more about home-cooked food. Also, I tried this recipe recently and it was fantastic. Though I ended up with some leftover dumpling mix and I had to add more vegetable broth to the soup. I used yellow split peas instead of green lentils, so it was a bit different from yours. But is was good nonetheless! Yum, I was lazy (well..also didn’t have the dumpling ingredients) and left out the dumplings but the soup was delish and easy to make. Thanks for posting.